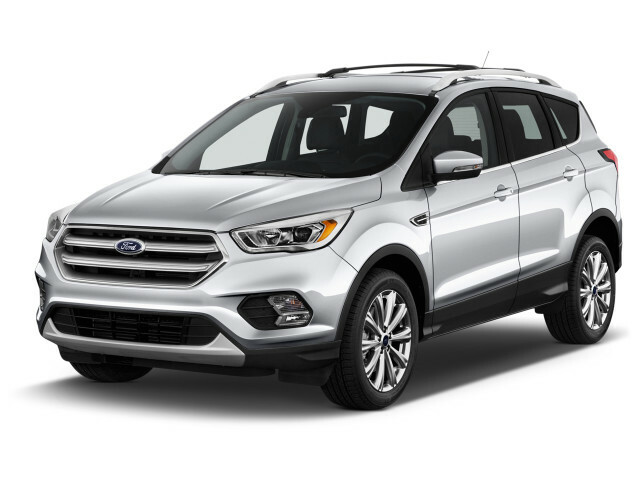 The Ford Escape is a popular compact crossover SUV that aims at the fastest growing new car segment. The current Escape hit the streets for the 2013 model year, after a 12-year run by the first-generation model. The Escape now comes in Titanium top trim, along with base S, SE, and SEL versions. In late 2019, a redesigned 2020 Escape will go on sale. Eventually, the lineup will include two turbo-4 engines, a hybrid, and a plug-in hybrid capable of driving for about 30 miles on electric power alone. In the Escape, Ford has a rival for juggernauts such as the Toyota RAV4 and Honda CR-V. 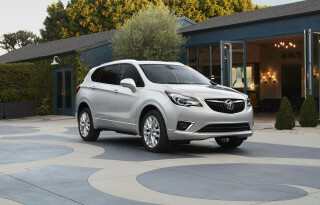 The Nissan Rogue, Hyundai Santa Fe Sport, and Chevy Equinox are rivals too. Ford's best-selling SUV received a mid-cycle update for the 2017 model year, adding new technologies, two new engines, a start-stop function, and a new look inside and out. New front- and rear-end styling was part of the revamp, but the more important changes came under the hood. 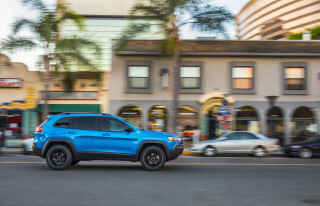 The base 2.5-liter inline-4 carried over, but mid-range Escapes were migrated to a 1.5-liter turbo-4 (in place of a 1.6-liter unit) or a new 2.0-liter turbo-4. Power output is about 179 horsepower for the smaller turbocharged inline-4, and 245 hp for the 2.0-liter version. Fuel economy improves slightly (both come with stop/start), and so does handling, with new springs and shocks. The interior was only slightly changed, with some new features such as fast-charging USB ports, updated climate and steering-wheel controls, and an electronic parking brake—but Ford says the addition of more soundproofing makes the Escape a quieter place to be. New safety equipment includes forward-collision warnings with automatic emergency braking, parking assistance, and lane-departure and lane-keeping assistance. The Escape's front crash protection was rated as "Poor" until 2016, when it improved to "Acceptable" by the IIHS. Ford changed some features in some packages for the 2018 Escape, and created a new SEL trim level. In its final year in this generation, the 2019 Escape saw only minor changes. 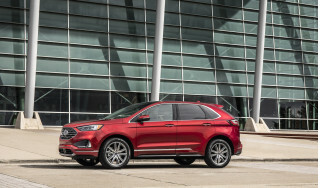 When it was first introduced in 2001, it picked up on the compact-crossover trend that was just emerging and almost instantly became one of Ford's best-selling vehicles. The Toyota RAV4 had started the niche, and was followed soon by the Honda CR-V. The Escape joined them as one of the most popular vehicles in the segment, with sales even increasing as the extended first generation aged. That first Escape made good use of space in a small package thanks to its tall and squared-off profile, accommodating passengers and cargo nicely. It also offered the smallest amount of off-road capability thanks to its ground clearance and available all-wheel drive. The car-like ride and handling were a product of it sharing some underpinnings with the Mazda 626, and it continued as a comfortable small-crossover option through 11 years on sale, with updates including revised sheet metal for 2004 and larger upgrades for 2007. The first Escape was a good choice for those who needed compactness and maneuverability yet wanted impressive safety and a flexible, spacious interior. Its original base engine was a 2.0-liter 4-cylinder, making 130 hp. It was underpowered, coarse and unrefined. In 2005, this engine was replaced with a 2.3-liter making 153 hp—enough to power the Escape confidently enough, provided you don't carry a heavy load or need to pass quickly on the highway. The 200-hp, 3.0-liter V-6 that was available gave the Escape a very different character. It's worth noting that real-world fuel economy in 4-cylinder versions of the Escape often didn't prove to be much better than that of V-6 Escapes. Through 2007, interior materials on all but the top Limited model were quite inferior to those of other vehicles in the Escape's class. The substantial refresh given to the model for 2008 fixed that, bringing upgraded materials throughout. At that time, the Escape also received new powertrains, including a 240-hp version of the 3.0-liter V-6 and a new 171-hp, 2.5-liter base inline-4. By 2010, its entertainment offerings were upgraded to include SYNC, Ford's voice-driven controller for phone, audio, and navigation systems. Throughout its first generation, the Escape earned mostly good scores for safety. The most noteworthy exception is for 2001-2007 models without the optional side airbags, and frontal performance for 2001-2004 models. In the IIHS's new roof-strength test, which came in late in the first generation, the Escape got a mediocre "Marginal" score that kept it from getting the Top Safety Pick. Federal testers did not re-score the Escape after it changed its testing criteria for the 2011 model year. Ford sold an Escape Hybrid from 2004 through 2012. Like other early Ford hybrids, the Escape used a system very similar to Toyota's Hybrid Synergy Drive, combining an Atkinson-cycle inline-4 with electric motors in a unique transmission and a large battery pack. 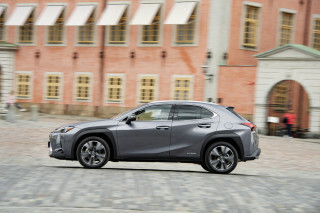 All-wheel drive was available, with about half of hybrid customers opting for it. The hybridized Escape was rated at 34 mpg city, 31 highway. The Escape also spawned the Mercury Mariner and the Mazda Tribute, both of which also offered hybrid variants at one time. Both were discontinued in the 2011 model year. For the 2013 model year, a new Escape was introduced. The launch of the 2013 Escape wasn't an easy one, with a number of high-profile recalls that happened in the new model's first few months on the market. For the larger recall, more than 70,000 2013 Escapes sold in the U.S. with the 1.6-liter inline-4 were recalled for overheating that could result in a fire risk. Two of the first few recalls were linked to its optional 1.6-liter EcoBoost turbo-4. A trio of 4-cylinder engines were offered in this Escape, with a carryover 2.5-liter 4-cylinder being the most inexpensive choice. It was paired with a 6-speed automatic transmission, as were both other engine choices. A pair of new turbocharged 4-cylinders took over the Escape's performance duties: a 178-hp 1.6-liter turbo-4 was the mainstream engine choice, while a 240-hp, 2.0-liter turbo-4 was the quickest Escape offered in the 2013 model year. All versions improved on fuel economy, with some versions earning ratings of up to 33 mpg highway. The Hybrid model did not return. In its place, Ford offered a more Prius-like gas-electric hatchback, the C-Max Hybrid. That Escape remained in the same compact size class, but with more ample interior and cargo space, as well as new conveniences and features. A new flip-fold mechanism for the rear bench seat helped tuck in the headrests for easier cargo loading, as did a motion-sensing automatic tailgate. The Escape's electric power steering could steer the car into a spot with brakes controlled by the driver. Blind-spot monitors could alert drivers of traffic approaching from the side and rear. Safety improved over the first-generation crossover, but more advanced testing challenged those initial good ratings. The new body structure helped the Escape earn the IIHS' Top Safety Pick status for 2013, but that rating was withdrawn for 2014 when the two-year-old car earned an embarrassing "Poor" rating on the small-overlap front crash test. 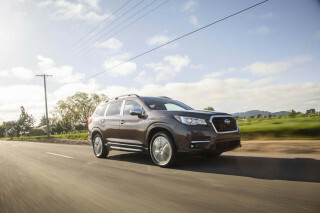 The NHTSA gave it four stars out of five overall and on most tests, with a five-star rating for side-impact protection. MyFord Touch was the Escape's first voice-controlled infotainment system. It ran audio, phone and optional navigation systems. For 2016, a new version of Sync, named Sync 3, took its place, with quicker and cleaner interfaces and better voice recognition. Starting in 2015, Lincoln offered its own more luxurious version of the Escape, called the MKC. Roomier,quieter,LOVE Sync 3 with Fordpass!